Judy, Brenton, Snickwad and Kelsey are all in the same class but they aren't friends. They're all very different. 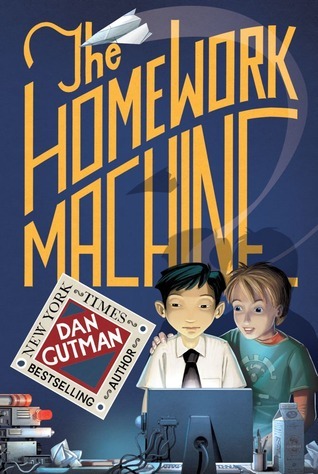 But when their teacher puts them all together in a group, they become friends because of a secret: The Homework Machine! I like that it was written from the point of view of several different people. They were all being interviewed by the police. It was about a group of people who didn't want to do homework, so they were all using the homework machine to do their homework. Brenton invented it over the summer. He didn't have any friends at all. So when the other kids in his group got interested, he let them use it. I thought it was a good book. I wanted to know what was going to happen next, but I didn't like that there wasn't much action in it. I would recommend it to my friends because it was a good book overall, and I know some of them don't like homework, and there's a message at the end that they should all do it! This review was written based on a copy of The Homework Machine that I purchased.